These are tools and resources we use. All free and readily available. Everything from Noisly (ambient sound) to Inflation Calculations. The top advice we give is to try: (1) Have I been pwned (2) Just Delete Me, and (3) Unroll.Me. This will really do wonders if you get lots of spam email. 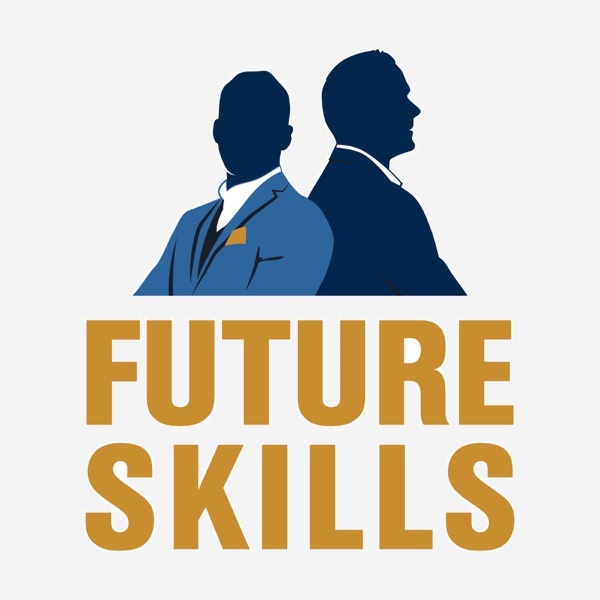 Email us at admin@futureskillspodcast.com if you want to recommend a tool/resource to us! Even if you’ve listened to all their episodes, the Season Finale will provide some much-needed spaced repetition and nuance on those ideas. Stay tuned for Season 2. *Read a written season summary on Ludvig’s blog. *Find a list of all Future Skills episodes + descriptions on the podcast website. If you're on our newsletter, you will receive written of this episode following shortly. *Rate us on iTunes. It will help more people find us and prepare properly. And stay tuned for Season 2. In today’s episode we pick up the talk from episode 34 with investor, author, podcast showrunner and technology entrepreneur Erik Townsend. Once again we cover a lot of ground, including Erik's views on decision making & strategy, technological progress such as automation, and his current views on gold, oil and Tesla. We also talked about the process of writing and publishing his book "Beyond Blockchain"
Not least we talked about Erik's views on cryptocurrencies and what could come after Bitcoin. Erik Townsend is a retired software entrepreneur turned hedge fund manager and host of the Macrovoices Podcast. Throughout his career, Erik has capitalized on his ability to understand complex systems and anticipate paradigm shifts far in advance of the mainstream. A teenage computer protégé, he spent most of his high school years at MIT's Artificial Intelligence laboratory, where he taught himself several computer programming languages. Erik became an independent software development and design consultant to Digital Corporation's manufacturing systems technology group at age 17. By age 20 he owned his first private aircraft. In today's Christmas episode we talk to futurist Martin Ford, popular speaker and author of bestselling books Rise of Robots and now Architects of Intelligence. This episode can be seen as the finale to the last three (#43 - robotics and #44 - global problems). We discuss where the future of AI, robotics, and other high-tech fields seems to be headed, based on the existing research and the lay of the land. Most important - Martin clarifies what might be reasonable to expect in terms of future progress in these areas, based on what he's learned from talking to the 23 leading innovators in these fields. What is a robot? Martin's definition. Is Martin positive or pessimist about the future in general? Will the job market be more or less mismatched in 10 years? The Protestant Work Ethic is now mismatched to highly technological economy; how can we shift this value/tradition? Universal basic income - could it work? Is it compatible with open borders? What did Martin Learn from the 23 Architects of Intelligence? (Demis Hassabis, Nick Boström, Ray Kurzweil, Geoffrey Hinton, etc) What's an evolutionary network vs neural network? The leading AI companies - what are they up to? Why bundling & leveraging existing technology in business model will be paramount. Can normal people invest in AI startups? Longevity escape velocity - and will Ray Kurzweil live forever? Deep Mind + will Google achieve AI monopoly? What are some Future Skills recommended by Martin? And much more...! Website Twitter New book - Architects of Intelligence ============= If you enjoyed this conversation: *Subscribe to Future Skills on: iTunes | Android | Stitcher | Spotify | Soundcloud *Subscribe to our newsletter for episode summaries for another 10 industries we did not get around to talking about in this episode. *Rate us on iTunes. It will help more people find us and prepare properly. We discuss 5 global problems (water, food, climate, energy, health and 5 big technologies that may be used in solving them (AI, automation, biotech, nanotech, 3D printing/additive manufacturing). We call this the 5x5 Matrix: Click for image (if it doesn't show below). 3 more problems are discussed: Education, depression, and migration. We also discuss a list of future industries. Roughly 10 are mentioned out of a total list of 32. Subscribe to our newsletter for episode summaries for another 10 industries we did not get around to talking about in this episode. ============= If you enjoyed this conversation: *Subscribe to Future Skills on: iTunes | Android | Stitcher | Spotify | Soundcloud *Rate us on iTunes. It will help more people find us and prepare properly. Alternate headline: "How You Can Own a Little Robot Butler, Like Rocky in 1984"
We will continue this discussion in next week's episode, talking about the 5 biggest problems to come (human demand) and the most likely (profitable) future industries. Join our newsletter for episode summaries and said bonuses. Pippa, short for “Philippa”, is a tech entrepreneur and a geopolitical consult. She has authored several books, including “Signals”, and “Geopolitics for investors”. In this conversation we focus on her most recent book “Leadership Lab” and learn about important neglected skills of good leaders and why managers keep getting blindsided by well-known trends. We talk about important megatrends like Big Data and the internet of (surveillance) things and how to adapt to technological change. Pippa is extremely productive, something she attributes to mostly working at just 80% of capacity. Among many thought provoking ideas, we discussed see-through clothes, why even Philippa Malmgren finds resistance to her suggestions, and why you should replace your ToDo list with a Be list. Finally we get to know how Pippa does her best work while she appears to be sleeping in, why culture eats strategy for breakfast, and how eyes can’t see clearly if imagination is out of focus. We answer questions from listeners and subscribers to our newsletter. What is the distinction between perseverance vs. bull-headedness? What websites do you often visit? What have you had to give up to get where you are today? What motivates you? What was the biggest factor that helped you being successful, other than yourself? How do you distinguish between superficial and actual knowledge; how do you know if you are really learning something? How do you integrate recently acquired abstract mental models from reading into your daily process? Should I pay down my mortgage or put away money for my daughter? What books do you recommend for getting started with investing? What trend or theory is most overhyped right now? What’s your best tips for not getting caught up in such hypes? In times of a bear market in bonds, does it still make sense to park some money in short term corporate bonds? Have you discussed neurolinguistic programming, NLP? How has podcasting impacted your lives? What possibilities have opened up and what have you learned from building a follower base? How do you best improve self-discipline? What areas in life make you struggle the most? Mikael, when you were at Futuris, what were the hardest parts of the job? We talk to Seth Godin, who is a serial entrepreneur, author, and one of the world’s biggest experts on marketing. Seth has written as many as 18 bestselling books. His writing is about the post-industrial revolution, the way ideas spread, marketing, leadership and how change happens. His new book is called This is Marketing. Seth is also the founder of the altMBA and the Marketing Seminar—two very successful online workshops. And, he has one of the world’s most popular blogs. Seth has had a really interesting career, and we discuss some of his different business projects, like the Worlds of Power (a book series that sold over a million copies), and we also hear what it was like to work with Isaac Asimov. 1) You should start a blog. Even if it’s anonymous. Because it’s a great creative medium, and everyone should be engaged in some kind of creative medium as a long-term investment into their career and personal development. 2) All major industries become rebundled—that is, they become changed from the ground up— about every 10 to 20 years. 3) Marketing is about creating stories that spread and drive change. So, if you’re in business or you’re an entrepreneur or you have a message—the way to become more successful is to become better at marketing. And Seth says that the most important thing is learning to tell the right stories. And so—how do you do this? This is what Seth will explain in this conversation. Tyler Cowen is an American economist, academic, and writer. He is the author of books like The Great Stagnation, Average is Over, The Complacent Class, and more. He occupies the Holbert L. Harris Chair of economics, as a professor at George Mason University, and is co-author, with Alex Tabarrok, of the popular economics blog Marginal Revolution. Cowen and Tabarrok have also ventured into online education by starting Marginal Revolution University. He currently writes a regular column for Bloomberg View. He also has written for such publications as The New York Times, The Wall Street Journal, Forbes, Time, Wired, Newsweek, and the Wilson Quarterly. Cowen also serves as faculty director of George Mason's Mercatus Center, a university research center that focuses on the market economy. In February 2011, Cowen received a nomination as one of the most influential economists in the last decade in a survey by The Economist. He was ranked #72 among the "Top 100 Global Thinkers" in 2011 by Foreign Policy Magazine "for finding markets in everything." His newest book (subject of conversation today) is Stubborn Attachments. It took him almost 20 years to write it. A few practical tips by Tyler: You should re-read the best books; you should have hobbies that make you think more, and you should argue for what you think is correct, but also understand it’s likely that you’re wrong. What is Tyler’s view of economic growth and how it happens? ­Have we seen the majority of economic growth from the Internet, or is most of it yet to come? What are the 2 things we—as a society—should prioritize above all else. And also: When should we prioritize economic growth over the redistribution of wealth by government? What are the 3 things scarce in today’s economy? How will future cities look different in 20-30 years from now? And, will the future economy reward generalists or specialists? We answer questions from listeners on our newsletter. 1) How can I change careers and become a real estate copywriter? 2) Will biotech become a big industry? Does Free Will exist? 3) Should you work in finance? How can I study better? How does one become a renaissance man? 4) What 3 top things would you recommend for business and career for a college freshman? 5) How do you develop an international career? What is the best job for an international career? 6) How do I start a commonplace in Evernote? 7) How much do you attribute luck to your finance career, Mikael? 8) What path would you take if you were 18 again? 9) What is the best way to get 10.000 euro from you? 10) People say gold has intrinsic value. Why? 11) How do you set your goals? Do you tell others? Or do you have systems and processes? Grandmaster of Memory Mattias Ribbing joins us today. He is an author, educator, and 3-time Swedish champion of memory sport. He’s also become a Grandmaster of Memory internationally. Mattias sits down for a conversation about mnemonics, biohacking, self-improvement, minimalism, and his thoughts on improving the school system. Are we being dumbed down? What does the new school system look like? Should we improve upon the existing one by making modifications, or should we do away with it and create a new one from scratch? What makes Mattias optimistic about the future? Which skills will become more valuable (or hard to replace) in the future? Please enjoy this conversation with Mattias. Also, watch his TED talk about memory techniques here. How To Avoid Herd Mentality. Stephenie Meyers broke all the rules and created a $3 Billion Dollar franchise (just with movies), sold 120 million books, and in the process, created a new genre: “Vampire-Romance”. So don’t underestimate her powers. We talk about how to get started diverging from the crowd. Before you can be a real contrarian, you need to practice being one in small things.... like daring to walk into forbidden places, going to places other tourists aren’t, and walking in the middle of the road, or across the square alone. All of these things, there is a slight resistance towards doing, wouldn’t you agree? Finally, we get to the big leagues—how to differentiate your thinking: (1) have different inputs for information and stimulation, (2) develop your own unique view, (3) analyze information differently or better than others. There are 4 modes of being: Herd Animal, Stoic, Independent, and Contrarian. Herd Animal = Go with the crowd, fit in, be nice, and stampede in collective panic. Stoic = Self-centered and serene, focused on one’s own world and work. Independent = Going with/against crowd, but without any strong emotion attached. Why you should not be like Warren Buffett (achieve the Sweet Spot). His personal role model—and why you can *not* emulate him (but rather find your own role model, that jibe with YOUR personal style.) The skills & experiences that equipped him to deal with complexities. The extreme fun of making sense of the world through history and a macro perspective. Why you can get away with breaking the rules—more often than other generations. In this second episode with Walter Kiechel, we continue where we left off last time in our discussion about Strategy, and Walter’s popular book “The Lords of Strategy”. In case you didn’t listen to the last episode, Walter has over 30 years of experience in the media industry and among other things --- he's been the Managing Editor of Fortune Magazine and the Editorial Director of Harvard Business Publishing (which includes the famous Harvard Business Review). You can get in touch with Walter through the Lords of Strategy website. Why does strategy consulting work? Why do companies hire these consultants? What is the “Jungian Shadow” of Strategy? And what did business thinkers Tom Peters and Peter Collin, tell Walter about the pitfalls of Strategy consulting. We also learn why Walter thinks clients of Strategy Firms are becoming more demanding than before, and what this means to the industry future. Then Walter tells us about the difficulty of behavioural change in business -- and why companies that become the leader in one industry rarely make the transition into the next big thing. If you learned something new about business thinking and the strategy consulting industry, please head over to iTunes and give us a review, that would help more people find the show. We talk to Walter Kiechel III. This episode will be particularly interesting if you'd like to get into the media business and understand how it works. Walter’s background before getting into the media industry and the story of how he made the decision of going to work for Fortune Magazine, instead of taking a higher paying job at a large consulting firm. How a big business publication or newspaper like Fortune Magazine runs. How Walter stopped working for Fortune Magazine, pursued a so-called Portfolio Career and helped start perhaps America’s most successful business newsletter Walter's career advice to someone who wants to get into the media business What his first impression was of Bruce D. Henderson – and why he thought he was kind of mad…. But how, despite this, Bruce became supersuccessful by relying on his top 2 strengths and how he amplifying them. And finally, he tells us of his meeting with Bill Bain, the legendary founder of Bain & Company, and what set Bill Bain apart from all the other Lords of Strategy. ... and a few more things, Mikael Syding picked up on his way from total beginner to the head of The European Hedge Fund Of The Decade. * Leave a review on iTunes to help us reach more people. * Join our newsletter for weekly summaries of the episodes. The 2x Rule is a practical application of the Experience Curve. It's a guideline for how you can plan your career. The 2x Rule states that you should be willing to take half the entry salary of a prestigious company in order to maximize on learning for some time while you are still young. As a final tip, if you are in university we advice you to make two lists: one with high-paying jobs and another with jobs you're really interested in. Stop thinking linearly. Start thinking exponentially. The Experience Curve states that things become cheaper and more effective to produce over time as you get better at it. The experience curve explains why specialization works so well. This is originally a concept from management consulting, invented by Bruce Henderson, the man who founded Boston Consulting Group. "[UNIT] Costs characteristically decline by 20-30% in real terms each time accumulated experience doubles." The reason The Experience Curve is important is that it’s a general principle that applies to you as an individual as well. And you can use this to plan ahead better in your own career. Once you specialize, you shouldn’t assume a linear progress, but rather, an exponential effect. If you liked this episode, go ahead and give us a rating on iTunes. It will help more people find us and prepare properly. Elkhonon Goldberg, Ph.D., is an author, scientist, educator, and clinician, internationally renowned for his clinical work, research, writings and teaching in neuropsychology and cognitive neuroscience. He is a Clinical Professor of Neurology at New York University School of Medicine. Diplomate of The American Board of Professional Psychology in Clinical Neuropsychology and Director of Luria Neuroscience Institute. A student and close associate of the great neuropsychologist Alexandr Luria, Elkhonon Goldberg has continued and advanced his scientific and clinical tradition. He has written three books about his research of the brain: The Wisdom Paradox (about cognitive aging), The New Executive Brain (about executive functions and decision making), and Creativity (the future of innovation). This episode is heavy in the history of neuroscience. The first 20 minutes we talk about his background. And his mentor Alexander Luria. And how he escaped Russia during soviet union.... by taking a bold risk and spending 6 months as a hospital orderly-- mopping floors. After that we talk about neuroscience and his three books, and where he thinks the field goes in the future, and whether he thinks it’s possible to model the human brain and create a General AI. Then for something completely different: The story of how he first got his idea about the 2 brain hemispheres -- while drinking beer with 2 pediatric doctors. And his acquaintance with Nassim Taleb and his friendship with Oliver Sacks. Finally, he tells us which Future Skill he recommends and what we can do to live more Wakeful lives. *Leave a review on iTunes to help us reach more people.